I'm told by a commercial that if I am suddenly lousy at video games, eating Slim Jims will make me better. 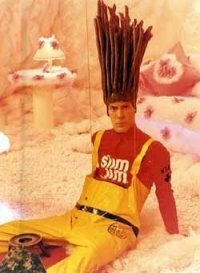 Theoretically, if I ate perhaps 400 Slim Jims I would become maybe passable. I could survive. My family has a high tolerance for decidedly deadly sodium, blood pressure, and cholesterol levels. My doctor might have a stroke, but I should be fine long enough to learn how to work dual thumbsticks without nauseating myself. Don't get me wrong, though, I still greatly miss those commercials where an anthropomorphic meat stick man single handedly tears up my insides like the riot scene in any college movie made before 1987. That was massively appetizing. Slime Jims: "Our product isn't good enough on its merits, but we'll give you superpowers for that other thing you like to do more."